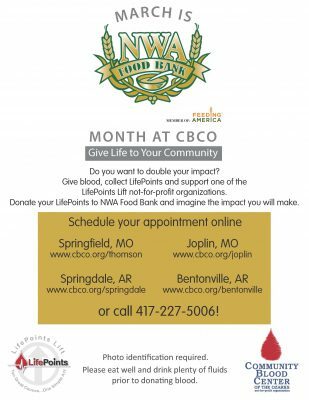 March 2018 is Northwest Arkansas Food Bank month at Community Blood Center of the Ozarks! It’s a great way to help two non-profits at the same time — CBCO with your lifesaving gift of blood and Northwest Arkansas Food Bank with your LifePoints which allows the organization to make sure more students will have access to immediate funding for health, hunger, and hygiene needs so they can stay in school and be successful. You’ll receive LifePoints for your donations all year round, and you can give your LifePoints to one of our agency partners at any time. Not just in March. But March is our time to share information about Northwest Arkansas Food Bank. Northwest Arkansas Food Bank was founded 1988 to serve four Northwest Arkansas counties by providing an affordable and credible food source to its partner agencies serving the hungry. NWA Food Bank currently has about 150 partner agencies ranging from food pantries, soup kitchens, shelters, and many more. Since 1988, NWA Food Bank has grown to serve 150 partner agencies and distributed 8.2 million pounds of food in 2015. Over 121,000 people are food insecure in the four-county area served by Northwest Arkansas Food Bank. 1 in 4 NWA residents are food insecure. 14% of Senior Citizens in NWA are food insecure. 38% of the clients served are under the age of 18. 61% of students in NWA on free and reduced meal programs. Northwest Arkansas leads the state in food insecurity. Arkansas has the second highest rate of food insecurity in the United States – 20% of Arkansans do not know where their next meal will come from. Arkansas has the highest rate of senior hunger in the United States. To learn more about Northwest Arkansas Food Bank, click HERE. Founded in 1995, CBCO has grown to serve 39 counties in three states and is the sole supplier of blood and blood products to 41 hospitals in southwest Missouri, northwest Arkansas, and southeast Kansas (as of 3/1/18).